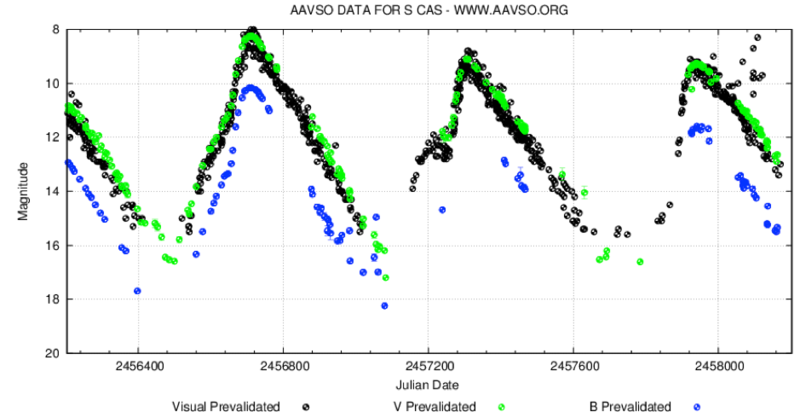 S Cas is an interesting Mira star that has been observed by AAVSO observers and members since 1865. Over 21,000 observations are in the AID from over 700 different observers as can be seen in the light curve shown below which displays all observations in the AID. It is one of the Legacy LPV Program stars. It is a star with good observational coverage, being visible almost year round with minimal seasonal gaps. It's spectral class is S3.4e-S5.8e according to the VSX and is classified as a Mira. The GCVS lists S Cas as having a visual magnitude range of 7.9 to 17.3 with a mean period of 608.2 days whereas the VSX lists the mean period as 612.43 days. This is quite a long period compared to many other Mira stars. What is also striking is the very large amplitude of up to 10 magnitudes that the star has displayed at times over it’s observational history. A DC DFT analysis of all observations in the AID shows a mean period of 613 days (harmonics of 306.5 and 204.3 days are clearly evident which indicates a non-sinusoidal element of the light curve which are discussed further below). 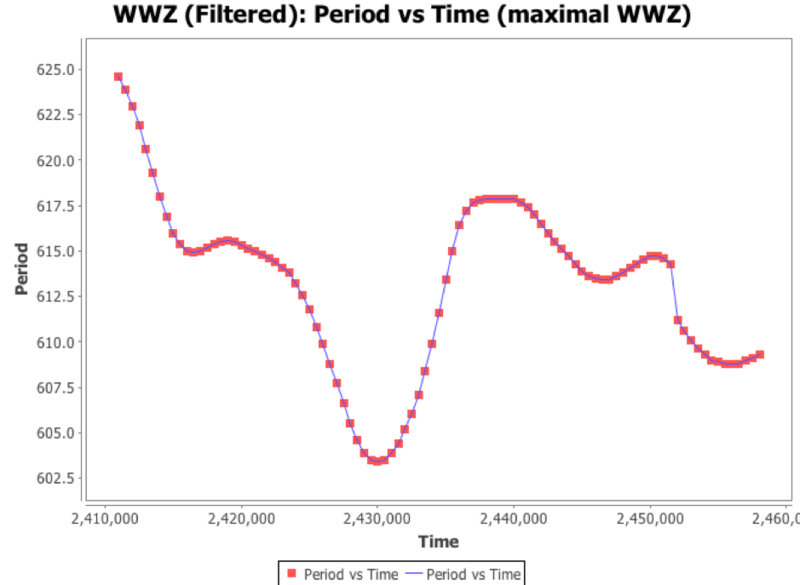 A WWZ analysis has shown that the mean period has been relatively stable remaining between a range of 602 to 622 days with a slow meandering behaviour which is quite common for many long period variables. As can be seen from the overall light curve above, the most interesting feature displayed by S Cas is an apparent decrease maximum brightness that occurred over a long period and reached a minimum around the mid 1970’s. Since that time the maximum brightness has been on a steady increase. Another interesting feature is that the minimum magnitude may have experienced some variability as well. Before the advent of CCD’s, it appears to have been relatively common to observe S Cas at minimum visually. For example in the 1930’s, the minimum was around 16thmagnitude and well determined visually. However in the mid 2000’s, CCD observers were following S Cas down to a minimum of magnitude 17.5. 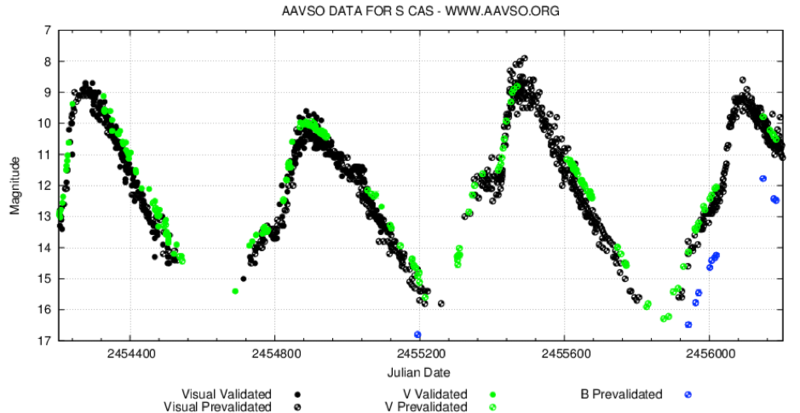 Visual observers seem to have given up on S Cas when it reached 15thmagnitude in more recent times. Due to the differences between visual and CCD observations as well as differences in sequences, it’s not clear whether the minimums have indeed became fainter over the observational history of the star. The overall amplitude of the light curve has also decreased and then increased reflecting the changes in the maximum brightness. 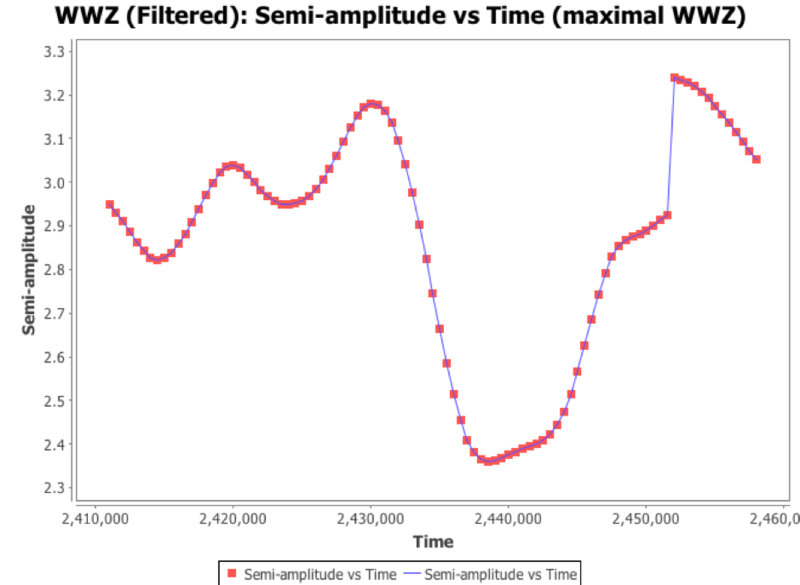 The semi-amplitude with time is graphed in the Figure below. Frank Schorr found that S Cas also displays humps in the ascending branch of it’s light curve. This is perhaps somewhat not surprising as humps appear relatively prevalent for the longer period Miras and with S Cas having a mean period greater than 600 days, there was a good chance that humps were going to be present. The graphs below present the last 12,000 days of data and two humps are clearly seen. The brightness appears to stagnate around 12thmagnitude for a short period of time that is clearly evident. It’s also clear that the humps do not occur on every cycle. The two shown are separated by 3 cycles. The frequency of these appears to be sporadic as the previous hump to these two appears over 10 years prior. Guandalini et al, reported the S Cas distance as 0.85 kiloparsecs and a bolometric magnitude of -5.71. Danilovich et al, reported S Cas as a relatively high mass-loss star losing up to 2.8x10-6 solar masses per year that was the highest in the selection of S stars that they studied. Cox et al, reported the presence of a detached dust shell around S Cas in their study of the interaction between the stellar winds of AGB stars and the interstellar medium. The deduce that these “rings” do occur for C and S type Mira stars that have experienced a thermal pulse. S Cas is an interesting Mira to follow so all are encouraged to maintain the excellent coverage.